We describe here a protocol for microinjection in the rodent brain that uses quartz needles. These needles do not produce detectable tissue damage and ensure reliable delivery even in deep regions. Moreover, they can be adapted to research needs by personalized designs and can be re-used. Paolone, G., Falcicchia, C., Verlengia, G., Barbieri, M., Binaschi, A., Paliotto, F., Paradiso, B., Soukupova, M., Zucchini, S., Simonato, M. Personalized Needles for Microinjections in the Rodent Brain. J. Vis. Exp. (131), e55751, doi:10.3791/55751 (2018). Microinjections have been used for a long time for the delivery of drugs or toxins within specific brain areas and, more recently, they have been used to deliver gene or cell therapy products. Unfortunately, current microinjection techniques use steel or glass needles that are suboptimal for multiple reasons: in particular, steel needles may cause tissue damage, and glass needles may bend when lowered deeply into the brain, missing the target region. In this article, we describe a protocol to prepare and use quartz needles that combine a number of useful features. These needles do not produce detectable tissue damage and, being very rigid, ensure reliable delivery in the desired brain region even when using deep coordinates. Moreover, it is possible to personalize the design of the needle by making multiple holes of the desired diameter. Multiple holes facilitate the injection of large amounts of solution within a larger area, whereas large holes facilitate the injection of cells. In addition, these quartz needles can be cleaned and re-used, such that the procedure becomes cost-effective. Microinjections have been used for a long time for the delivery of pharmacologically active compounds to modulate neuronal activity in specific brain areas. In addition, they have been used to inject toxins near particular neuronal populations, to mimic neurodegenerative events characteristic of certain diseases, for example 6-hydroxy-dopamine in the nigrostriatal dopamine system to mimic Parkinson's disease1,2 or the immunotoxin 192 IgG saporin to lesion the cholinergic system3. More recently, microinjection procedures have been used to deliver viral vectors or cells grafts for gene or cell therapy of experimental brain disorders4,5. The classical type of needles employed in these studies is made of stainless steel. Although easy and practical to use, steel needles have a number of problems6: they are relatively large and may cause tissue damage, with leakage of the blood-brain barrier and activation of astrocytes; moreover, they may produce coring of brain tissue that gets into the needle creating an obstacle or even completely avoiding flow of the desired solution. More recently, glass needles prepared ad hoc from capillaries have been introduced in use7,8. These do not cause significant tissue damage nor astrocyte activation, but are relatively flexible and may bend when introduced in deep structures, reducing the accuracy of localization (personal observations). There is therefore a need to reduce as much as possible damage (especially when performing experiments to heal damage) while increasing accuracy and reproducibility (i.e., ensure that all solution is delivered and ensure correct localization). Moreover, it would be desirable to use different needle designs to ensure optimal distribution of the injected solution in brain areas with varying geometries. In this article, we describe a protocol to prepare and use quartz needles for microinjections in the rodent brain. Due to the high melting point, quartz capillaries cannot be pulled on a conventional puller and therefore, have not been used in the past to generate needles. Quartz, however, offers some important advantages over glass, in particular high rigidity and break resistance9. Because of their rigidity, quartz needles are ideally suited for injections into ventral brain regions. Because of their high resistance to breakage they can be modeled to include multiple holes, obtaining designs that may prove most effective even when targeting brain regions with complex geometries10. All experimental protocols were approved by the University of Ferrara Ethical Committee for Animal Experimentation and by the Italian Ministry of Health. The ARRIVE (Animal Research: Reporting In Vivo Experiments11) guidelines have been followed. Clean and sterilize the quartz capillaries (see Table of Materials) by placing them for 5 min in distilled water, 5 min in ethanol 99%, and 5 min in diethyl-ether. Leave capillaries under the hood for at least 1 h to let them dry completely. Prepare the needles using a laser puller according to parameters that allow the production of a sufficiently long, sufficiently thin needle, depending on the individual needs. NOTE: We use a laser puller (see Table of Materials). Use a two lines program for pulling. The first line uses high power, the largest scanning length (corresponding to FILAMENTS VALUE) and no pulling force. This combination of parameters leads to the melting of the largest portion of the capillary with the lowest extension speed, allowing for the shaping of a long needle with large inner/external size and reduced shank. In this way, the needle preserves a high mechanical resistance and wide inner diameter that allows the passage of stem cells or viral particles without clogging. Velocity and delay of this program line should stop the capillary extension before the tip becomes too small and long, missing the required mechanical and shape characteristics. The second line of the pulling program is executed automatically, once the quartz cools down (5 s). Parameters of power, filament and pulling force are functional to cut a tip with the shortest possible tip length and steep shank, avoiding the separation of the two needles with a tip rupture. Routinely, with our equipment we use the following: (a) Line 1 = power 990, filament 5, velocity 130, delay 110, pull 0; (b) Line 2 = power 970, filament 3, velocity 0, delay 70, pull 0. Put the needles in a Petri dish previously cleaned with ethanol 70%. Cover the dish with a plastic paraffin film. Cut the capillaries at the micro-dissector. At the start-up, let the laser run an autocalibration process to verify power and energy delivered. Then set the cutting parameters. NOTE: We use a micro-dissector (see Table of Materials) and the following parameters: laser power pulse energy (63 µJ), laser beam diameter of 20% of the maximal aperture (maximal aperture: 1.0 µm), and cutting speed of 10% of the maximal speed (maximal speed: 30 µm/s). Firmly fix the needle on the microscope table and position its tip at the center of the computer screen. On the menu bar, click on the pencil icon and use it to draw a mark for the laser cutting of the needle. NOTE: The cut should be at an angle of about 45 ° with respect to the needle surface. On the side bar function, select the flag containing the "START CUT" button to allow the laser to cut the previously marked spot. If needed, cut side hole(s) by repeating the procedures described in 1.5.2-3; there is no need to reposition the needle (Figure 1). Connect the needle to a void pump through a plastic tube. Turn the pump on and manually set the forward flow rate at a moderate speed (3 µL/min). Aspirate the 99% ethanol first and then the distilled water to remove impurities due to cutting. Aspirate the 99% ethanol again to ease drying. NOTE: Each step should last at least 3 min. Store the needles in a properly covered Petri dish until the day of surgery. Needles may be re-used; at the end of the experiment, clean with bleach and ethanol to remove the solution and possible tissue residue. For a more complete cleaning, put the needles in a micropipette storage jar with the tip pointing downwards, fill the jar with distilled water until the tips are covered, boil for 1.5 min to remove any leftover tissue, then wash with ethanol. Following the instructions provided by the pump user manual, select the settings menu to calibrate the pump according to the diameter/volume of the microinjection syringe and set the flow rate at 0.3 µL/min. Fill a 10-mL syringe (equipped with a blunt needle (e.g., Hamilton needle, 30 G) and a short polytetrafluoroethylene tube) with sterile water and use it to fill the microinjection syringe (after having very cautiously removed the piston) and the injection assembly parts kit for the manual microinjection pump (MMP). NOTE: The MMP kit is used to securely mount the needle in the stereotactic frame (Figure 2). The kit includes: a polytetrafluoroethylene tubing, luer-to-tubing coupler, pipette holder and gaskets for pipettes with different outer diameters. Connect the needle to the MMP kit. Flush more water across the system through the 10-mL syringe, and check whether the water comes out of the needle. NOTE: Make sure to remove any air bubble inside the system by repeating the filling steps. Disconnect the 10-mL syringe from the microinjection syringe while slowly pushing the piston in order to leave a drop of water at the top of the microinjection syringe. Insert the piston in the microinjection syringe. 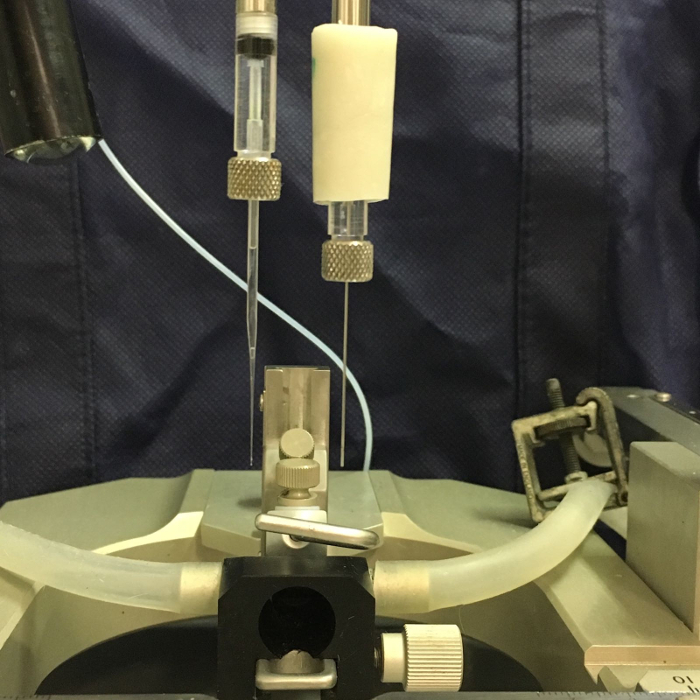 Connect the microinjection syringe to the pump and set the flow rate at 0.3 µL/min. NOTE: Wait until there is a drop leaking from the tip of the needle and then let it go for another 3 min. Set the flow at 0.1 µL/min and start the surgery procedure. The pump should be ongoing while performing the surgery. NOTE: For the experiments reported in this article, we use male Sprague Dawley rats of 300 g (3 months of age). However, the procedure is applicable to other species, mice in particular. Induce general anesthesia using a method approved by local regulations. NOTE: We use a mix of intraperitoneal injection (i.p.) of 85 mg/kg ketamine and 8 mg/kg xylazine for 20-50 min of anesthesia. It is important that tail and/or toe pinches are used to ensure the animal is fully sedated. Level of anesthesia and basic vitals are assessed before surgery begins and monitored every 10 min while performing the surgery. Animal body temperature is maintained constant before, during and after surgical procedures using a water re-circulating heating pad. Animals are monitored until fully recovered (e.g. they are upright and ambulatory). In addition, animals receive analgesics (tramadol, 5–7 mg/kg i.p.) post-operatively every 24 h for three days. Shave the animal's head and adequately prepare the surgical site for aseptic surgery. Perform a two-stage scrub with iodine-based solution (Betadine) followed by 70% ethanol. Furthermore, to maintain asepsis, wrap the surgical site with a surgical drape (in the video has been omitted for demonstration purposes). Position the rat in the stereotaxic frame over a water re-circulating heating blanket. To provide additional pain relief, at the site of surgery apply 0.5% lidocaine solution (do not exceed 7 mg/kg). Pre-sterilize all surgical instruments using a bead sterilizer or liquid cold disinfection by immerging the equipment in either 2% glutaraldehyde plus 7.05% phenol (Sporodicin or Cidex) followed by rinse with sterile water or saline. The disinfection must be performed even between procedures. Make a longitudinal cut over the skull by using a sterilized scalpel. Be gentle to avoid excessive bleeding. Open the scalp using a flat spatula and apply surgical clips on the flaps of skin to keep it open. Very gently, detach the periosteum to expose the bregma and the area of the skull through which the needle will be inserted. Mount the arm on the stereotaxic frame (while the flow is ongoing) and move the tip of the needle exactly on top of bregma, paying attention not to break its tip. Annotate the antero-posterior and medio-lateral coordinates of the bregma and translate to the desired coordinates. Guided by a stereomicroscope, lower the needle until its tip almost touches the skull, mark the drilling spot after raising a little the stereotaxic arm. Drill (drill tip Ø: 0.8 mm; drill speed: 1,000 rpm) the skull on the marked spot. Care must be taken not to penetrate the dura during the drilling procedures. During drilling, drip sterile saline to avoid bone damage and necrosis. Cut a small piece of plastic paraffin film and place it on the skull. Using the 10 µL pipet, make a drop of the solution to inject on the plastic paraffin film. Stop the pump, slightly retrieve the pusher of the pump and create a little air bubble in the capillary by gently pulling the piston of the microinjection syringe. Lower the stereotactic arm until the tip of the needle reaches the drop. Draw the sample by pulling (very slowly) the piston of the microinjection syringe, avoiding any bubble formation. Replace the pump pusher in contact with the piston and turn on the pump at a flow rate of 0.3 µL/min. Wait until the formation of a drop (a few min) before proceeding to the next step. NOTE: In the present example experiment, artificial cerebrospinal fluid (aCSF) was infused in the striatum (AP: +1.5, ML: ±2.7; DV: -5.0) and in the dorsal hippocampus (AP: -3.5, ML: ±2.1; DV: -3.5; in mm from dura), 2 µL/site. To facilitate the comparison between the two injection methods, each brain area was infused using a quartz needle in one hemisphere and a 26 G blunt tip or a 30 G bevel-tip stainless steel needle in the other. Lower the flow to 0.1 µL/min, nick the dura with a stainless steel bevel-tip needle and slowly lower the stereotactic arm on the dorso-ventral axe, entering the brain tissue. When the desired position is reached, go down an additional 0.1 mm, stop the pump, raise the stereotactic arm by 0.1 mm and start again the pump at the flow to 0.3 µL/min. NOTE: The reason to maintain a slow flow while lowering the needle is to ensure a positive pressure that avoids penetration of small fragments of tissue in the needle itself. Such an event would obstruct the tip, impairing the delivery of solution. Since the flow rate is very slow while lowering the needle and the speed of lowering is about 10 s/mm, this implies that the amounts of solution that remain along the needle track are negligible compared to those injected at the target site. This precaution may be avoided when using needles with side holes. Start the timer and wait the needed time depending on the desired volume to inject (for example, 6 min 40 s if injecting 2 µL). Monitor the bubble movement while injecting. At the end, stop the pump and wait 5 min before slowly retrieving the needle. When the quartz needle is completely extracted, start the pump again and check for the formation of a drop at the tip of the needle. Seal the opening in the skull surface with bone wax, remove the hemostatic clips and suture the scalp, coat the area around the wound with an antibiotic cream (e.g., neosporin) and return the animal to the home cage. NOTE: Following the euthanasia protocol approved by the institutional ethical committee, for the experiments described in this article, animals were deeply anesthetized with an i.p. injection of 43 mg/kg ketamine and 7 mg/kg xylazine, and decapitated. Brains were removed, postfixed in formalin for 48 h and paraffin embedded. 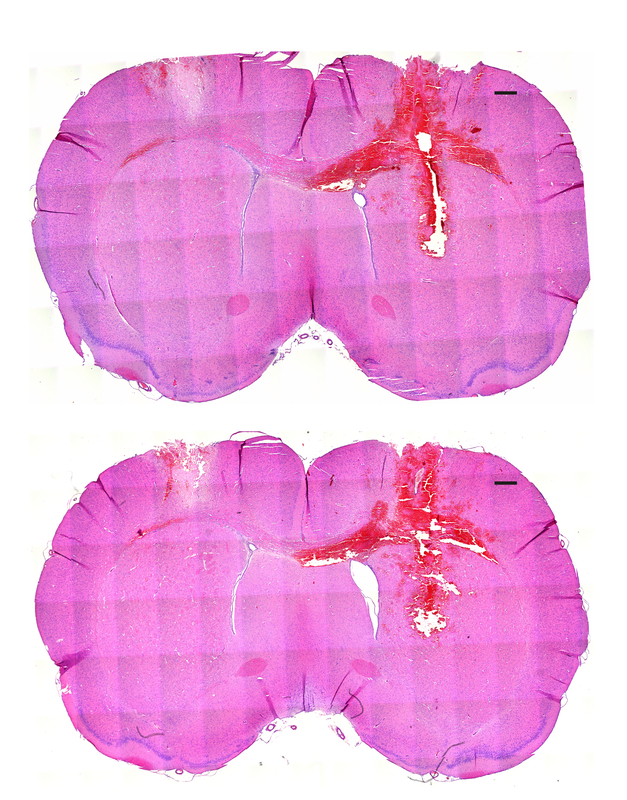 Coronal sections (8 µm) of the brains were sliced using a microtome. 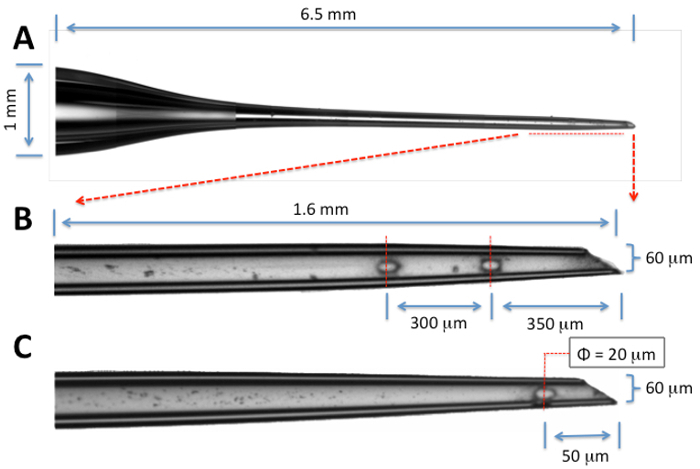 We compared damage induced by direct microinjection in the rat dorsal hippocampus and striatum using a quartz needle (60 µM external diameter tip; one 20 µM diameter side hole; type C, Figure 1) compared with two classic, 26 G blunt end and 30 G bevel edge stainless steel needles. To this aim, we injected 2 µL of aCSF in the right and left dorsal hippocampus and striatum using respectively the quartz and the steel needle and, 48 h after injection, we evaluated tissue damage using the Hematoxylin-Eosin (HE) staining. We chose an early time point after injection to better appreciate the acute mechanical damage produced by the different needles (in time, tissue repair mechanisms could obscure the initial damage)7. 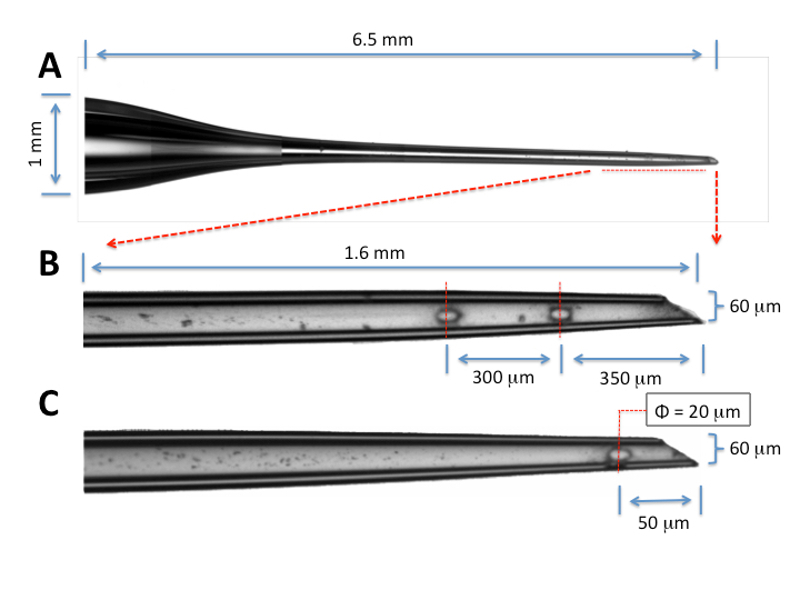 Following the protocol described above, the quartz needle did not produce any detectable damage and a barely detectable needle track, whereas brain regions injected through the 26 G steel blunt end needle exhibited a marked damage (Figure 3). 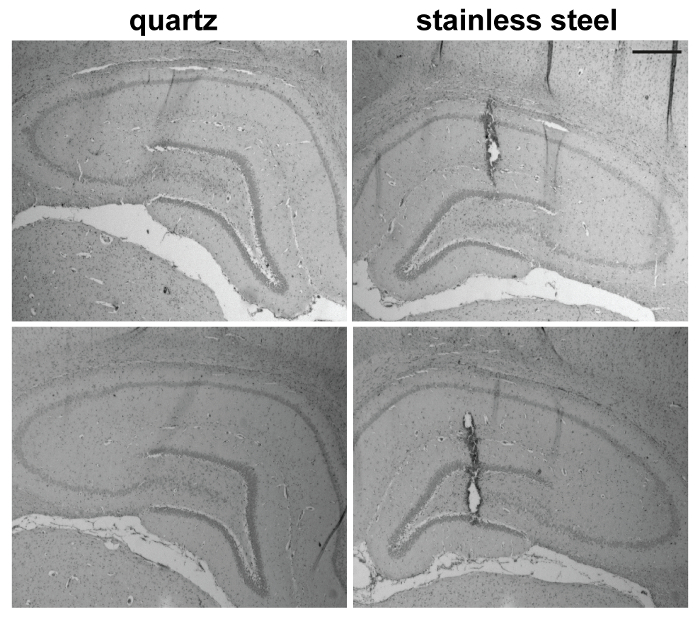 The 30 G bevel angle (30 °) stainless steel needle induced a more limited, yet clearly detectable brain lesion both in the striatum (Figure 4B) and in the dorsal hippocampus (Figure 5). To prove that the injection of aCSF was equally successful with both needles, in a separate set of experiments we injected 2 µL of Trypan Blue (Figure 4A). Importantly, all retrieved quartz needles were perfectly intact, i.e., we never observed any damage due to the insertion maneuvers. Figure 1: Microscopic image of a quartz needle tip, showing different diameters of tip and holes employed for injection of fluids. Low magnification picture in (A) and higher magnification in (B) and (C). The needle may be prepared in different manners (different length, hole numbers and hole dimensions) according to the anatomy of brain region, the spreading goal and the viscosity of the solution, as illustrated in (B) and (C). Notice the smooth cut of the holes and tip obtained using low power laser microdissection. Please click here to view a larger version of this figure. Figure 2: Set up for microinjections. Picture showing the kit used to secure the quartz pipette (left) and the stainless steel needle (right) to the stereotactic micropositioner. Please click here to view a larger version of this figure. Figure 3: Coronal sections showing less damage using the quartz needle. 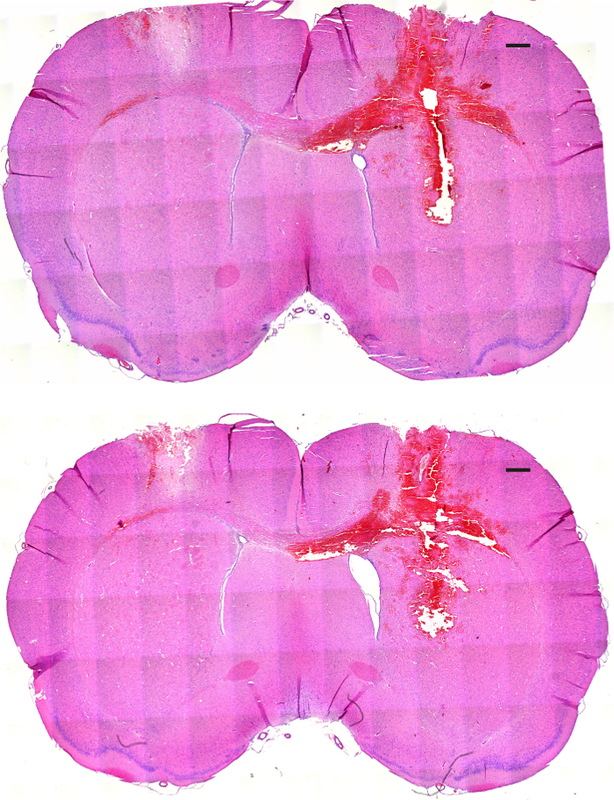 Coronal sections (8 µm thickness) of rat brains at the level of the striatum showing a comparison between the damage produce by injection of 2 µL aCSF using a quartz needle like the one shown in Figure 1C (left side) and a 26 G blunt end stainless steel needle (right side). Some damage was produced in the cortex on the side of the quartz needle, due to improperly deeply drilling the skull. These images, taken from two different animals, are representative of all 5 animals included in the experiment (scale bar = 500 µm). Please click here to view a larger version of this figure. Figure 4: Spreading and tissue damage. (A) Distribution of Trypan blue injected in the striatum with a quartz needle (left), as compared with a 30 G bevel edge stainless steel needle (right). (B) Coronal section of rat brain at the level of the striatum, stained with HE showing a comparison between a quartz needle and a 30 G bevel edge stainless steel needle (scale bar = 500 µm). In the boxes (left and right), a higher magnification of the damage (scale bar = 200 µm, 10X). These images are representative of 5 animals included in the experiment. Please click here to view a larger version of this figure. Figure 5: Damage induced by a quartz needle and a 26 G bevel edge stainless steel needle at the level of dorsal hippocampus. The two cases shown here are representative of 5 animals included in the experiment (scale bar = 400 µm). Please click here to view a larger version of this figure. The technique described in this article fulfills the needs outlined in the Introduction for optimizing microinjections that are performed for various purposes12. The needles described here reduce damage to a minimum, essentially non-detectable level; at variance with glass needles (that are prone to bend), quartz needles are rigid and ensure a reliable hit of the desired brain region even in deep coordinates. Moreover, the side hole ensures delivery of the solution even if the tip hole gets occluded during insertion in the brain tissue. Limitations and alternatives. Due to high melting point, quartz capillaries cannot be pulled on a conventional puller, i.e., they require access to costly equipment. Glass capillaries are equally good in terms of avoiding damage to tissue, but less reliable for injections in deep structures and more fragile (i.e., less flexible in terms of design). However, if the goal is injection in superficial structures like the cortex or the dorsal hippocampus and there is no requirement for multiple holes that would increase the risk of needle breaking, glass needles certainly represent a valid and cheap alternative. A limitation of both quartz and glass needles is that they do not permit multiple injections at different time points, like stainless steel needles coupled to guide cannulas. Therefore, steel needles remain the best option for these applications, with the advice to avoid relatively large (26 G) and/or blunt edge needles. Critical steps in the protocol. Overall, the protocol described above is very straightforward and should not be difficult to use for any researcher experienced in microinjections. Once the needles are made available, the regular precautions employed for anesthesia, surgery, slow insertion and removal of the needle, constant and slow rate of infusion regulated by a minipump, will ensure good and reproducible results. Advantages and further developments. As stated above, the key advantage of quartz needles is to couple minimal mechanical damage with the possibility to personalize the design of the needle. We prepared needles with multiple holes and different diameters, which can be adapted to the specific experimental needs. For example, different diameters may be needed to inject viral vectors and cells compared with drugs or toxins; multiple holes may be useful to ensure injection of larger amounts of solution within a larger area and may become especially useful for difficult geometry brain areas. The great versatility of this technique can be also exploited to optimize the spread in the tissue of viral vectors for gene therapy or cells. Indeed, we use these needles to inject viral vectors or cells. Other advantages include the possibility to re-use the needles. To do so, needles can be cleaned with ethanol and bleach to remove the solution and possible tissue residue. The repeated use of a single needle can make the procedure cost-effective in spite of the relatively high cost of production. This work has been supported by a grant from the European Community [FP7-PEOPLE-2011-IAPP project 285827 (EPIXCHANGE)]. Kirik, D., Rosenblad, C., Björklund, A. 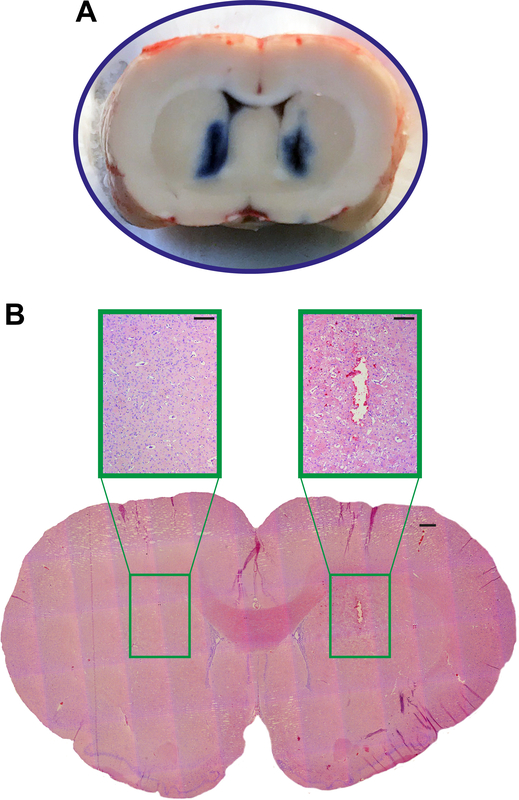 Characterization of behavioral and neurodegenerative changes following partial lesions of the nigrostriatal dopamine system induced by intrastriatal 6-hydroxydopamine in the rat. Exp Neurol. 152, (2), 259-277 (1998). Paolone, G., Brugnoli, A., Arcuri, A., Mercatelli, D., Morari, M. Eltoprazine prevents levodopa-induced dyskinesias by reducing striatal glutamate and direct pathway activity. Mov Disord. 30, (13), 1728-1738 (2015). Paolone, G., Lee, T. M., Sarter, M. Time to pay attention: attentional performance time-stamped prefrontal cholinergic activation, diurnality, and performance. J Neurosci. 32, (35), 12115-12128 (2012). Shoichet, M. S., Winn, S. R. Cell delivery to the central nervous system. Adv Drug Deliv Rev. 42, 81-102 (2000). Simonato, M., et al. Progress in gene therapy for neurological disorders. Nature RevNeurol. 9, 277-291 (2013). Björklund, H., Olson, L., Hahl, D., Schwarcz, R. Short-and Long-Term Consequences of Intracranial Injections of the Excitotoxin, Quinolinic Acid, as Evidenced by GFA Immunohistochemistry of Astrocytes. Brain Res. 317, 267-277 (1986). Paradiso, B., et al. Localized delivery of fibroblast growth factor-2 and brain-derived neurotrophic factor reduces spontaneous seizures in an epilepsy model. Proc Natl Acad Sci U S A. 106, (17), 7191-7196 (2009). Falcicchia, C., et al. Silencing Status Epilepticus-Induced BDNF Expression with Herpes Simplex Virus Type-1 Based Amplicon Vectors. PLoS One. 11, (3), 1-17 (2016). Munoz, J. L., Coles, J. A. Quartz micropipettes for intracellular voltage microelectrodes and ion-selective microelectrodes. J Neurosci Meth. 22, (1), 57-64 (1987). Sutter Instruments. P-2000: Laser-Based Micropipette Puller. Available from: http://www.sutter.com/MICROPIPETTE/p-2000.html (2017). Kilkenny, C., Browne, W., Cuthill, I. C., Emerson, M., Altman, D. G. Animal research: reporting in vivo experiments: the ARRIVE guidelines. J Cereb Blood Flow Metab. 31, 991-993 (2011). Torres, E. M., Trigano, M., Dunnett, S. B. Translation of cell therapies to the clinic: characteristics of cell suspensions in large-diameter injection cannulae. Cell Transplant. 24, 737-749 (2015).